Kaputt! Finished! Just like that?! What happen to it all? And the worse part...so has that well deserved leisurely break from work and the daily commuting on overly crowded tubes and trains (sort it out TFL, for crying out loud). So with a well stuffed tummy, still digesting the New Year's Even Tapas feast and the turkey and mince pies from Christmas, I had to make that well trodden journey back to the office again, the same old routine. But first, I need to sort the blog out. Too many half completed backlog of posts. A few reviews and recipes that will hopefully see the light of day over the next couple weeks. Being the first recipe post of the year 2013, I just want to share something that I've made just before Christmas which have been sitting quietly on my draft folder. 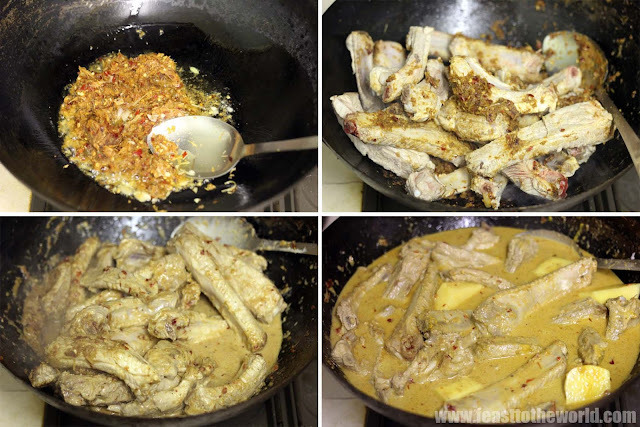 This is not a traditional Nyonya recipe. I have adapted this slight from my nan's original Babi Gulai which uses pork belly rather than ribs. But as I had some ribs in my fridge, I thought I'll used that and added my favourite bamboo shoots. This may all sounds a bit doolally , but it is rather typically Nyonya. 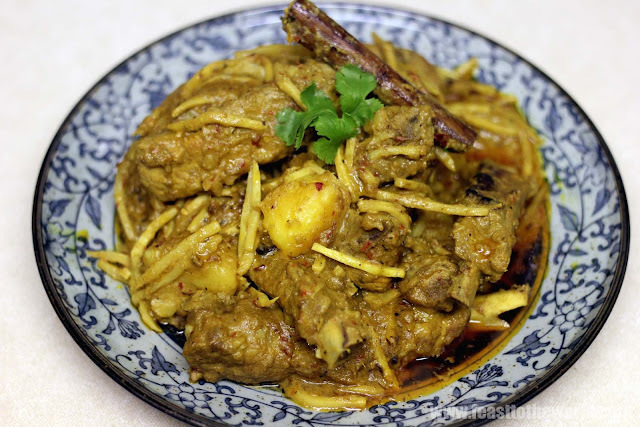 So come to think about it, its like a mashup of Babi Gulai and Rebung Masak Lemak, another classic Nyonya bamboo shoots curry. The end result is something quite satisfying. The braised ribs absorbed such intense flavours and the meat just falls effortless off the bone. 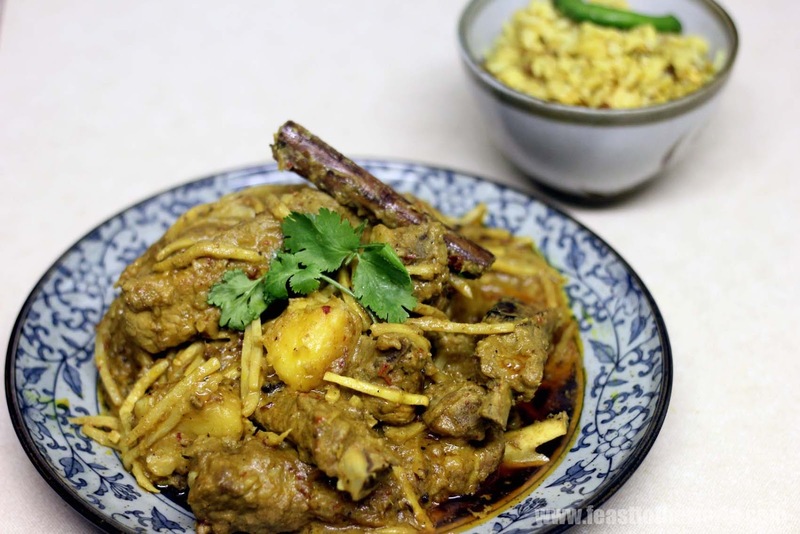 The sweet bamboo shoots added a nice crunch to the otherwise, just soft, creamy texture. Borrowing the famous saying of Colonel Kentucky, it was finger lickin' good and it soothed the carnivorous meat lover in me. Bring a large pan of water to the boil. Blanch the ribs for a few seconds and drained. Pound all the ingredients for the rem pas/spice paste in a mortar and pestle to a paste or alternatively, do this in a food processor. Pour in the coconut milk, then add the potatoes along with the star anise, cinnamon,cloves and season with salt. Bring to the boil and simmer on a low heat for 35 - 40 minutes, until the sauce has thicken and the meat are cooked through. Add the bamboo shoots and cook for another 5 minutes.